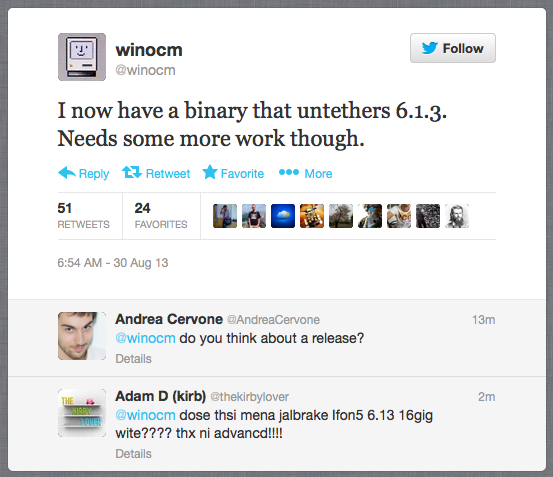 Hacker winocm has announced that he has a binary that will perform an untether of the iOS 6.1.3 jailbreak. I now have a binary that untethers 6.1.3. Needs some more work though. I have my own code running inside the iOS 6.1.3 kernel on iPhone 4. Notably, he says it's not useful for iOS 7. It’s not useful on iOS 7. I don’t care about iOS 7. Other people are taking care of iOS 7. We'll let you know as soon any more details come into light. You can follow Limerain on Twitter, Facebook, or RSS to be notified of any updates.